Fars said the drone was captured "in the last few days" without giving further details. A spokesman for US Naval Forces Central Command in Bahrain said: "The US Navy has fully accounted for all unmanned air vehicles operating in the Middle East region. 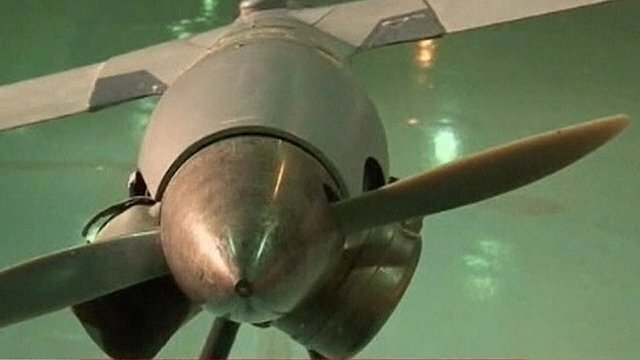 Iranian state television has shown images of what it says is an unmanned US drone captured in its airspace. The Revolutionary Guards said they had brought down a ScanEagle - one of the smaller, less sophisticated drones employed by the Americans. Rear Admiral Ali Fadavi told the Fars news agency that the drone had conducted several reconnaissance flights over the Gulf in recent days. But the US Navy said none of its drones was missing in the Middle East. Other nations in the region, including the United Arab Emirates, also operate ScanEagles - low-cost, long-endurance aircraft with a 10ft (3m) wingspan, Associated Press says. Rear Adm Fadavi said that "such drones are usually launched from large warships". "Our operations in the Gulf are confined to internationally recognised water and air space. "We have no record that we have lost any ScanEagles recently." Last month, the US said Iranian warplanes had shot at a US surveillance drone flying in international airspace. Iran said the aircraft had entered its airspace. November also saw Iran's ambassador to the United Nations, Mohammad Khazaee, write to Secretary General Ban Ki-moon to complain about what he said were repeated US violations of Iranian airspace near the Bushehr power station, describing them as "illegal and provocative acts". A year ago, Iranian TV broadcast pictures of an American RQ-170 Sentinel surveillance drone that Iran said had been brought down using electronic warfare. The US said it had malfunctioned. Iran rejected a US call for the return of the drone. It subsequently claimed to have developed its own unmanned drone. Washington and Tehran are engaged in a dispute over Tehran's nuclear programme. The Revolutionary Guards are an elite unit of the Iranian military which operate their own naval forces.